If Addie will stick her head underwater (the one step that's holding her back from graduating to the next swim class level) then she can have the flashlight. "Maybe I don't need the flashlight." Adam tried convincing her that she was able to put her head under water. When that didn't go so well, he told her that Lily will put her head under water and Lily will move ahead of her in the class. "Maybe I will buy the flashlight for Lily." Somehow I don't think this bribe had enough bite to it. We'll see how they do when Lily starts swim lessons next week. It was an Eastery Egg-stravaganza this weekend. 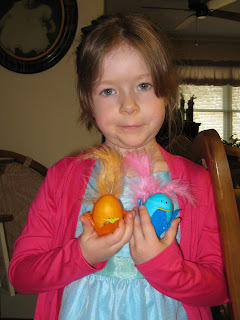 On Thursday at Oma's the girls made little chicks out of eggs. Addie insists upon carrying them around the house and playing with them, even though they have not been refridgerated. We keep asking her not to play with them. I think they may have to find their way to the garbage can. Saturday night we dyed eggs with Grandma and Grandma's neighbors. Lily loved drawing on the eggs with Crayon. The girls made a huge mess dropping eggs into the dye, but they had a great time. Good thing Grandma put down a tablecloth first!! 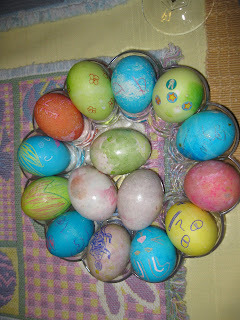 The dyed eggs. 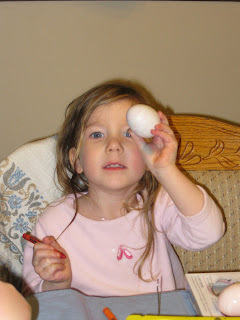 Addie announced to everyone on Sunday morning that they absolutely could not eat any eggs with a "face" on them. I have no idea what we're going to do with the "Face Eggs," but I guess they're being saved for a reason. The girls had a great time this weekend hanging out with their cousins, aunties and Grandma Dude. We spent Friday night at Grandma and Grandpa's with Auntie Rene. The girls got to stay up very late and eat Asian food. Sleeping in Grandma's big bed with Mommy was a huge treat for Lily. Addie stayed in Auntie's old room and was the first one up in the morning. Naps were at a bit of a premium all weekend, but the girls had a blast. We stayed up late Saturday night in the hotel room and ate pizza. On Sunday the cousins came to the hotel and played in the pool. Both girls crashed in the car on the way home. I think they would have slept the entire 5 hour drive if I hadn't wanted to stop to eat. Hopefully more photos will be coming - I took some great photos of the girls with other people's cameras.